Atlanta, Ga. – While Georgia’s economy will grow faster than the nation’s next year, the pace of job growth in the Peach State will slow, according to the Georgia Economic Outlook report by the University of Georgia Terry College of Business. 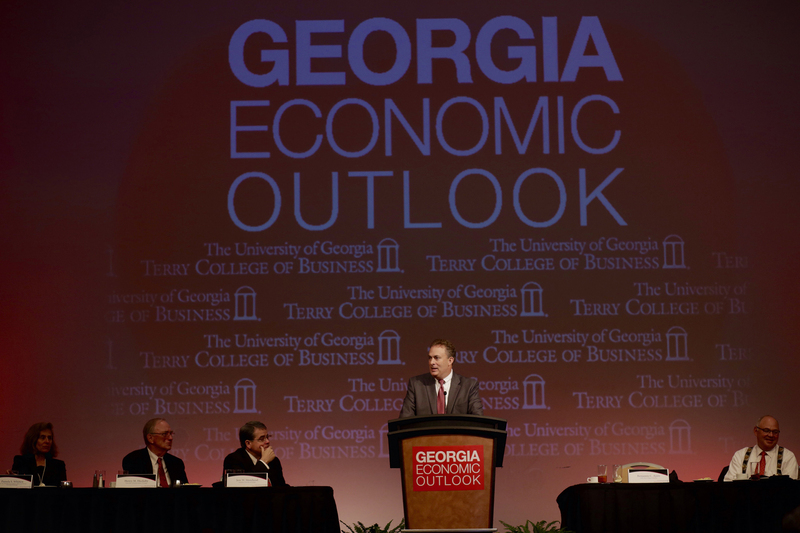 Speaking at the Georgia Economic Outlook series kickoff event in Atlanta, Terry College Dean Benjamin C. Ayers said Georgians can look forward to a rise in personal income of 5.7 percent and a state GDP increase of 3.3 percent. The Economic Outlook series is the state’s premier forecasting event. Using economic modeling from Terry’s Selig Center for Economic Growth, the series will travel to nine other cities across the state this season, sharing economic predictions with business and government leaders. To see a full calendar of events, visit www.terry.uga.edu/eo. Georgia’s 2016 growth stems in part from projects already in the economic development pipeline, such as Baxter International’s new facility and GM’s IT-innovation center, as well as a continued upcycle in the housing recovery, supportive demographic forces and a rise in small business starts and expansions, Ayers said. But while these projects will create employment opportunities, job growth will slow in the coming year. Specifically, Georgia’s non-farm employment will rise by 2.4 percent, which is nearly half a percent below the estimate for state employment in 2015. The nation as a whole won’t fare quite as well. While the U.S. can expect modest GDP growth at 2.5 percent, it will average only a 1.4 percent rise in employment. This is still good news, but it represents a slowdown of the post-Great Recession economic momentum. The entire Economic Outlook report, outlining industry trends in Georgia and the nation, is available for purchase online at terry.uga.edu/selig. For more information or to register to future events, see terry.uga.edu/eo.